Welcome to English Grammar 301 with roti. Today's lesson is the word had: simple past or past participle of the verb to have. - Correct: "My friend Rishi-rish and his better-half, Kirsty-rish had me over for supper." This implies that I was invited to the hosts' home to enjoy supper with them. - Incorrect: "My friend Rishi-rish and his better-half, Kirsty-rish had me for supper." This implies that the hosts are heartless cannibals. The next lesson in English Grammar 301: knead: to work and press into a mass (usually of dough). Not to be confused with homonym kneed, as in, "That fat man swiped my burger so I kneed him in the gonads". - Correct: "To make roti, you knead the dough gently." 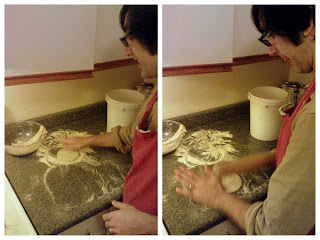 - Incorrect: "To make roti, you knead to punch the dough until your knuckles are sore." Roti, by the way, is another flat Indian bread made of a semolina or whole wheat flour that (contrary to naan) isn't leavened... instead, the magic happens on your stovetop! Rishi-rish was kind enough to share his recipe with me, so I will kindly plug his Elephant Stone music project. Here's how to knead your own! Add atta into a large mixing bowl, and add a little bit of warm water at a time. Continue to mix and knead dough until it reaches medium/soft consistency -- not quite bread dough, and definitely thicker than pancake batter. Cover bowl with a clean dish towel and let it rest for 10 minutes. Heat a cast iron skillet (tava) on medium heat. Turn another element to high and place a raised metal stand over the element. This is used for finishing the roti. Take a golf ball-sized ball of dough and dip it in extra atta. Flatten the roti into a thin disk with your hands. Keep the unused dough covered. Lightly dust a rolling pin with atta and roll out the roti to 10cm diameter. Add a little atta to prevent it from sticking to the rolling surface. Place roti on tava. When the roti's color darkens, flip it over using tongs and cook the other side. When air bubbles appear on the roti, grab the roti with tongs or if you're a sadist, with your fingers, flip it over and place on the raised metal stand. When roti puffs up, remove from the stand using tongs and place in a plate or basket lined with a clean dish towel. It will unpuff as it cools. Rub roti and yourself with butter or ghee. Repeat for remaining dough until you've finished the dough. Eat liberally with your favourite Indian dishes. * Er... you might have noticed that I have begun properly casing my entries, starting with this one. I figured if I help enforce the grammar police, then I might as well follow their own stupid rules. I'm totally going to attempt this over the weekend, open flames get me hot.